Plastic side-release buckles are versatile, interlocking buckles that fasten attached pieces of webbing together easily, with quick release capability. 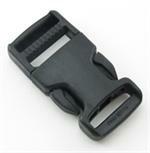 Side release buckles can be dual-adjusting, single-adjusting, simple-looped, and contoured. Please note that there are two categories of single-adjusting side-release buckles. The first is the domestically produced, made-in-the-USA version. The other is the imported version. We are currently transitioning our inventory away from the imported version in colors other than black. However, we still have stock on some of the imported colors. Contoured side-release buckles are light-duty, single-adjusting clips that are useful for applications where the webbing length is relatively short and contours around the application itself (ex., pet collars). Dual-adjusting side-release buckles are used in applications where constant adjustment of the webbing strap lengths are required. Made In USA Single-Adjusting Side-Release Buckles are domestically produced, high quality clips that are both UV and IR treated. Single-Adjusting Side-Release Buckles are used for applications where one end of the webbing is sewn down or locked in a fixed position and the other end is adjustable.